(Nanowerk News) Computers which use light to process large amounts of data faster than ever before are just one of many groundbreaking potential applications of a new £6 million research programme at Queen’s University Belfast and Imperial College London, launched today, 1 September 2009. The Engineering and Physical Sciences Research Council (EPSRC) is funding the two universities to establish a world-leading research programme on the fundamental science of so-called ‘nanoplasmonic devices’. Nanoplasmonic devices’ key components are tiny nanoscale metal structures - more then 100 times smaller than the width of a human hair – that guide and direct light. 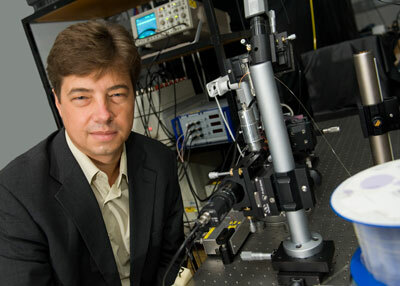 Anatoly Zayats from Queen's University Belfast's Centre for Nanostructured Media. The structures have been tailor-made to interact with light in an unusual and highly controlled way. This means they could one day be used to build new kinds of super-high-speed ‘optical computers’ – so named because they would process information using light signals, instead of the electric currents used by today’s computers. To speed up the process, the scientists at Queen’s and Imperial hope to develop a way of sending the signals along the same wires in the form of light. In order to achieve this, they are developing a raft of new metallic devices including tiny nanoscale sources of light, nanoscale ‘waveguides’ to guide light along a desired route, and nanoscale detectors to pick up the light signals.